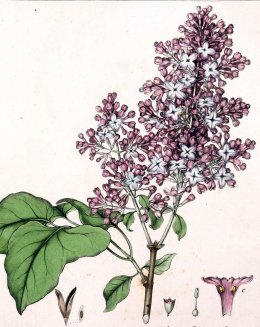 Syringa vulgaris ( Lilac) from P. Bulliard, Herbier de la France, vol. 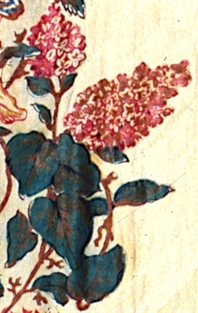 7: t. 265, 1776-1783. Syringa vulgaris (Lilac) growing in a modern garden. Description: Syringa vulgaris (Lilac) is a member of the Oleaceae (Olive) family. William Aiton's1812 book Hortus Kewensis, ed. 2, vol. 4 recorded that this native of Mexico was introduced to Britain about 1796. 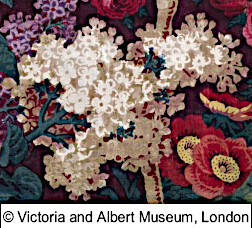 Wild lilacs are purple but cultivated forms can also be pink, white, or yellow. 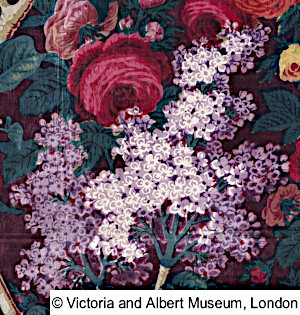 White is a very common color for lilacs on chintz. Hydrangea, also known as Hydrangea macrophylla, is an ornamental shrub composed of many smaller white, pink, or blue flower clusters arranged in a ball. The leaves are large and shaped like a broad lance-head. It differs from Lilacs which have narrower petals and heart shaped leaves. 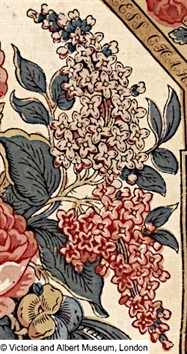 The small clusters of flowers of Lilacs are arranged in a long, pointed flower head (inflorescence). Snowball Viburnum, also known as Viburnum opulus, is an ornamental flowering shrub with three-lobed leaves and large clusters of 5-petaled white flowers resembling snowballs. 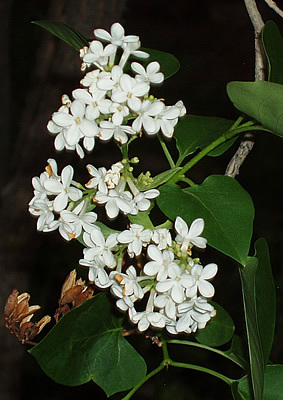 It differs from Lilacs which have narrower petals and heart shaped leaves. 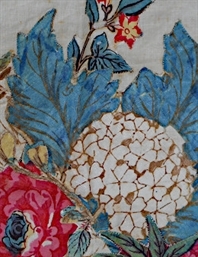 Panel 21 in Appendix I of Merikay Waldvogel, "Printed Panels for Chintz Quilts: Their Origin and Use," Uncoverings 34 (2013): 125. 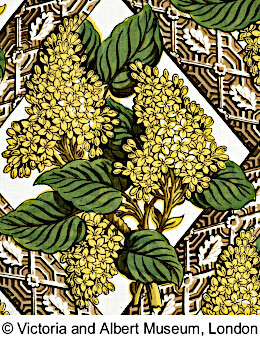 Syringa vulgaris (Lilac) from the Edisto Island Museum, Edisto Album Chintz Applique Spread, dated 1863. Photo courtesy of Edisto Island Museum.